Many customers do not understand the fiber jumper management methods, we have to learn how to properly manage fiber patch cord and other related products, which will bring a lot of benefits for our work. For example, you can easily find the installed fiber jumpers, then the maintenance work will become much faster, and this can also provide the correct bending radius protection. In the process of network reconfiguration, accessibility plays a vital role in directly affecting the reliability of the network and the cost of network reconfiguration. Hope to be able to help everyone. Pay attention to the bending radius of the fiber jumper. Generally speaking, the diameter is 1.6mm and 3.0mm fiber jumper can withstand a bending radius of less than 3.5cm, while the MPO/MTP fiber jumper can withstand a bending radius of fewer than 10 times its diameter. Do not pull or squeeze fiber jumper. When installing a fiber jumper, excessive force may exert pressure on it and the connectors on both ends, thus affecting its performance. It is worth noting that if you need to use a larger effort to pull a fiber jumper, there may be some problems in the middle. According to the fiber jumper path routing by the jumper. If the existing jumper length fits the current application, you can reuse the jumper, but you still need to take the jumper off the fiber-optic wiring rack and then reinstall the jumper in the new path. This is the only way to ensure that the jumper is not knotted, curved, and extruded. In order to effectively route the jumper, the jumper should find a suitable path between two ports, while avoiding the twisting and crowding of the jumper. Managing fiber jumpers in bundles or systems can make the panels look neat, but the risk of excessive extrusion is increased by tying or tying it too tightly. To avoid this problem, the fiber jumper can be properly “untied” to allow it to be “free” to live. Labeling is very necessary, but also is one of the most important work for network system administrator. 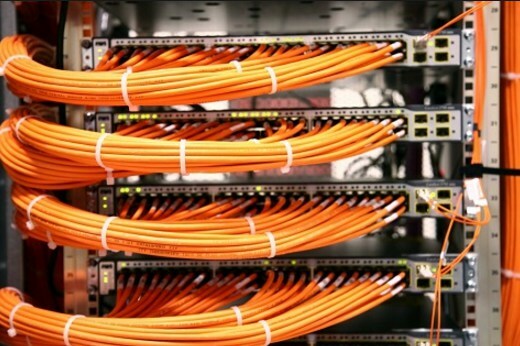 In the network cabling infrastructure of any management points (including wiring panels), correct labeling is necessary, so that network technology workers can accurately identify the starting point and end of the cable. Check the fiber jumper for physical damage, including the indentation and connector damage caused by the sudden bending of the sheath. Strengthening the management of fiber-optic jumper can not only increase the reliability and flexibility of optical fiber network system but also reduce the operation and maintenance cost of optical fiber network. The bending radius of the optical fiber, the path of fiber jumper, the availability, and the physical protection are the main factors that affect the management of fiber jumper, and if we can meet these four points in the management of fiber jumper, you will be half successful.